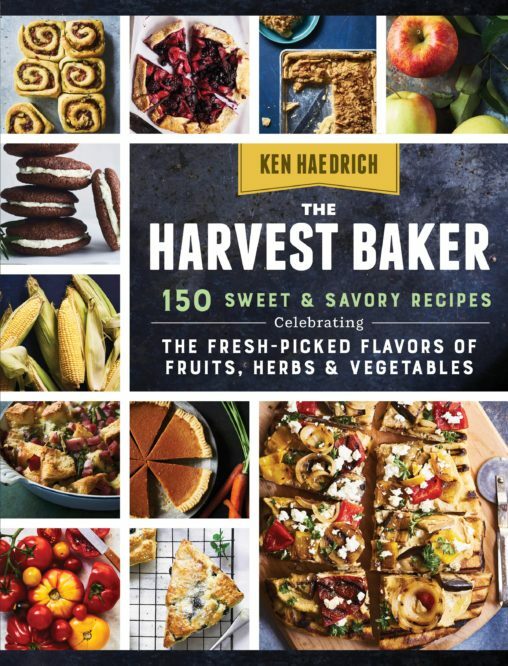 We are in the thick of entertaining season, a time of year fraught with the inevitable questions about what to serve guests and family when they arrive for a few hours…or a few days. Even those of us who love to cook and bake still want to prepare dishes that work hard for us, leaving us plenty of time to mingle and be merry. 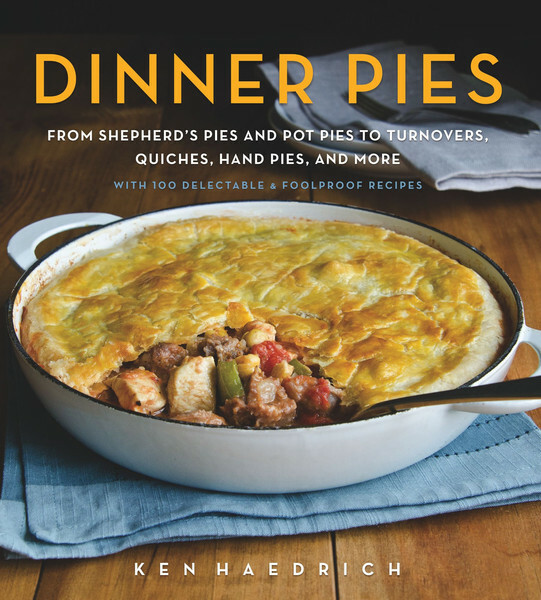 Which is why I’m such a big fan of quiche, the savory pie that was born to entertain. 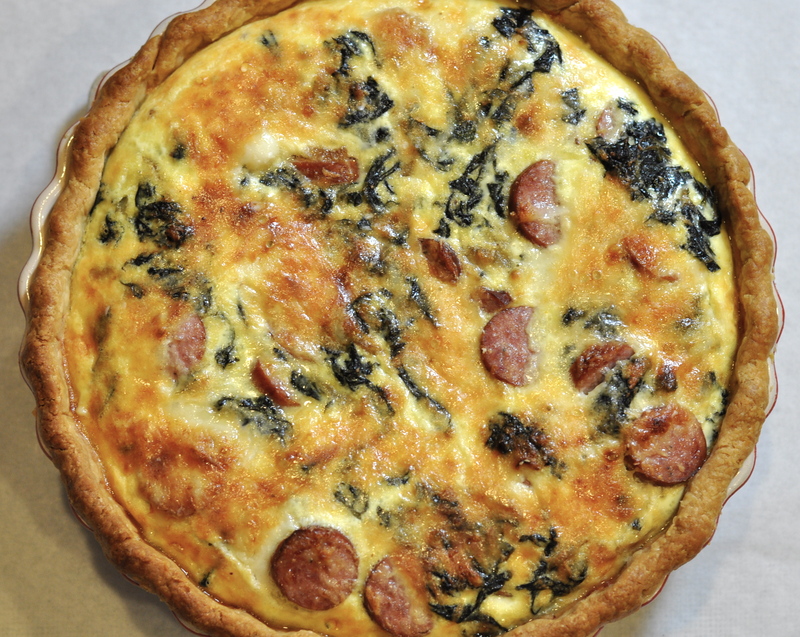 Quiche can be made a day or two ahead and refrigerated, and it takes kindly to a reheating. It can be sliced thin to serve a lot of people, or thick for something more substantial. And it’s equally welcome at breakfast as it is for dinner or served an appetizer. What more could you ask for? A great recipe, right? Well I’ve got one for you: this Swiss Chard & Smoked Turkey Sausage Quiche. Perhaps you’ve noticed good looking Swiss chard in the market lately. That’s no surprise: Swiss chard likes cool weather and it thrives well into the fall in some parts of the country. Now is the time to turn that to your advantage. 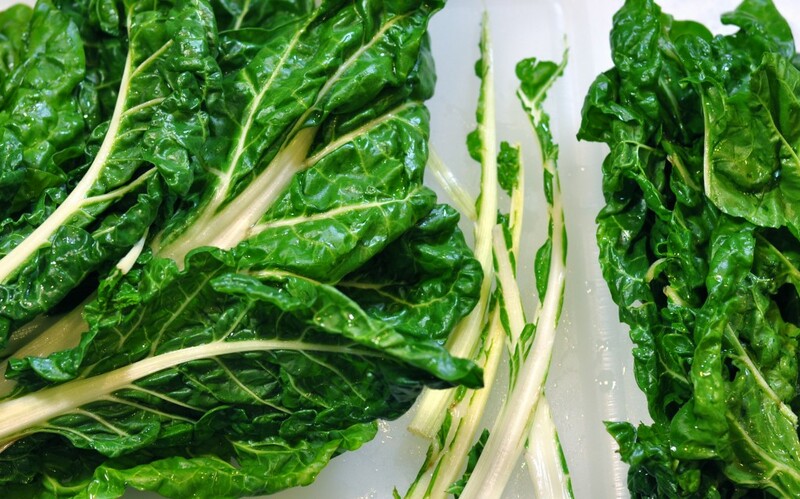 The first thing I do with Swiss chard is rinse the leaves well and remove the center ribs, be they white – like these here – or red. The ribs are edible, but sometimes a little chewy, so I prefer to remove them for a delicate quiche. The neatest way to remove the ribs is by cutting them out with a paring knife but you can simply rip the leaves off the ribs if you like. We set the leaves aside to saute for the filling. Our pastry is the one I use so frequently (while promising to expand your pastry repertoire greatly in the coming year.) Quiche can be baked in any number of pans, including a pie pan or tart pan with a removable bottom, but I prefer one of these attractive and colorful Le Creuset ceramic pans that can come directly to the table and still look stunning. Notice (in the photo below) the way I intermittently “pinch” the dough down the outside of the pan. It looks somewhat careless or accidental, but I do this on purpose to anchor the pastry to the side of the pan – a little extra insurance that the pastry will stay where it should and not slide down the sides. Unless you’re fond of moist, flabby pastry, no good will come of not prebaking it. The photo below isn’t the greatest, but I wanted you to see how the aluminum foil is pressed down smartly into the bottom crease. That’s important because the weight of the beans (that you’ll use to hold down the foil when you prebake it) will prevent the pastry from pulling away from that crease and forming a weak spot that could break when the filling is added to the shell. Incidentally, use regular aluminum foil for this step, not heavy duty. Regular is more flexible and easier to mold to the shape of the pan. 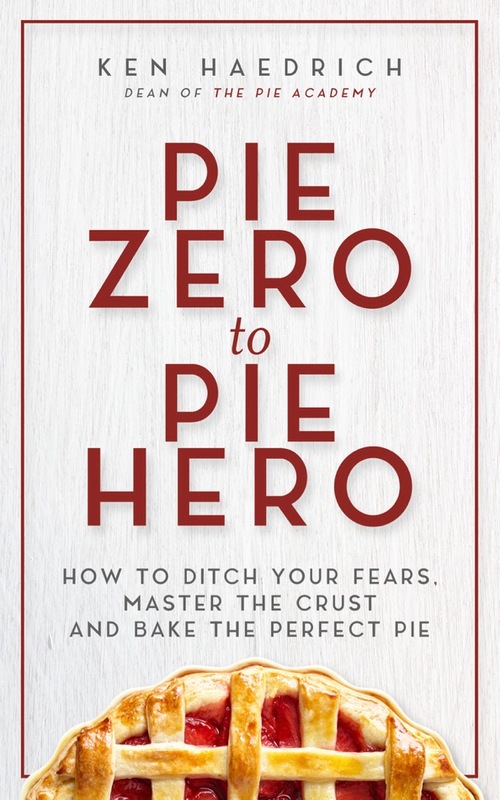 As for arranging the filling in your beautifully prebaked crust, your tart shell is now your canvas and how you fill it will reveal something of your sensibilities as a cook-artiste. You have not put forth this creative effort only to dump everything into the shell, nilly willy, and bake it. 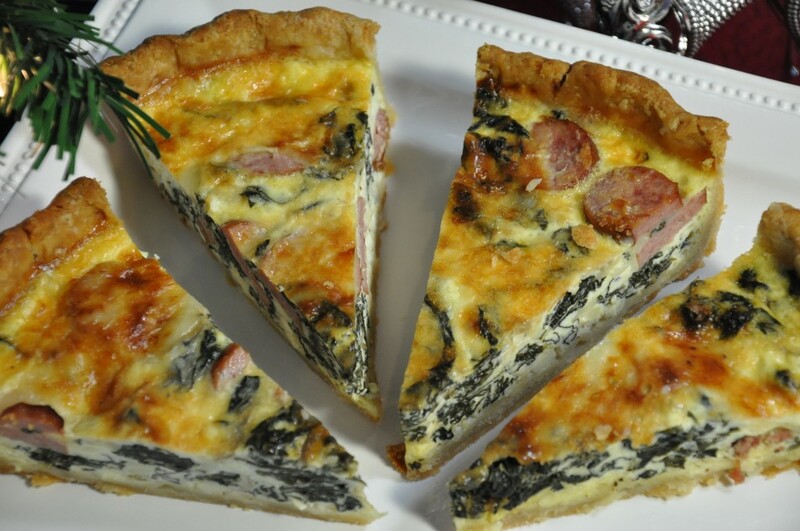 Ask yourself: how do you want the surface of the quiche to appear? As in the photo above, do you want delectable little teases of Swiss chard to peak through? Do you want the sausage to make a bold statement…or be, for the most part, a hidden surprise? How should you layer the cheeses so they’re most pleasing to the palate and the overall appearance? Yours is the hand that will make these important decisions, and you’ll do fabulously. On a sheet of lightly floured wax paper, roll the pastry into a 13" circle. Invert the pastry over a 9 1/2" - 10" quiche pan or tart pan, center, and peel off the paper. 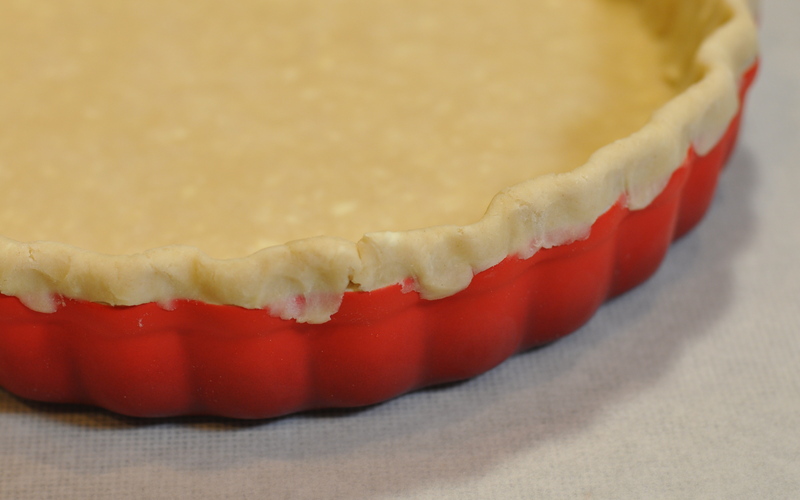 Gently tuck the pastry into the pan, without stretching it, then pinch the edge into an upstanding rim. Place in the freezer for 15 minutes while you preheat the oven to 400°. Bake on the center oven rack for 15 minutes. Reduce the heat to 350°. 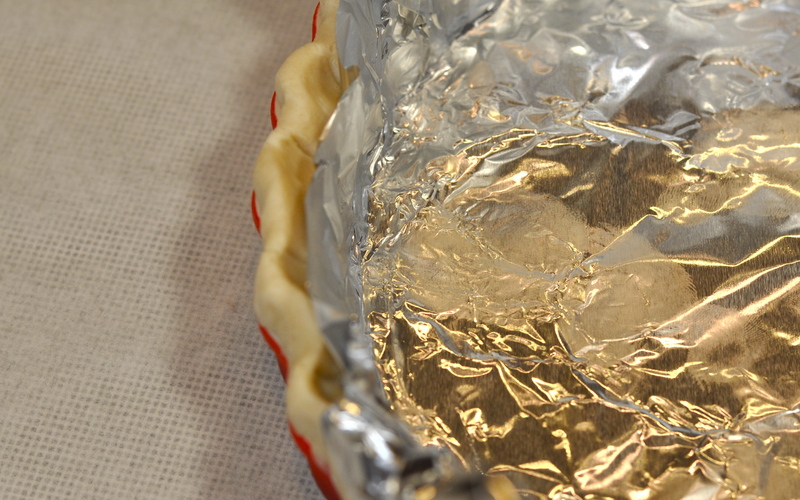 Remove the shell from the oven, then carefully lift out the foil and beans. Using a fork, poke the bottom pastry 6 or 7 times; the holes will keep the pastry from puffing. Put the shell back in the oven and bake another 10 to 12 minutes. Cool on a rack. 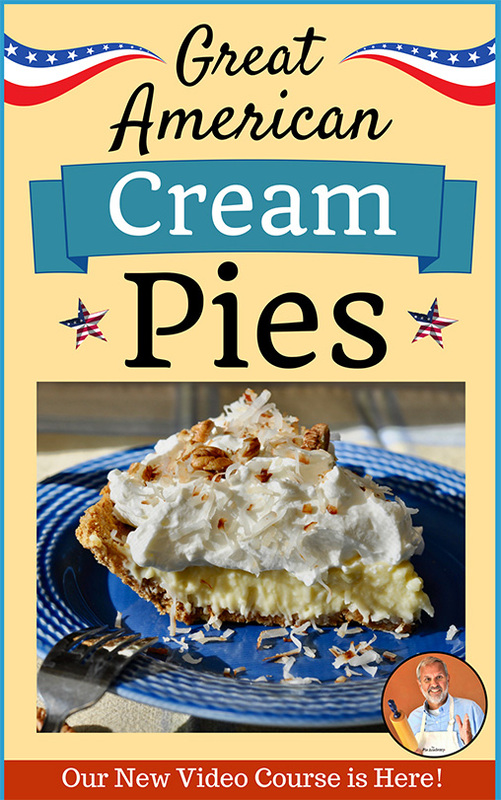 (Plug the holes with dabs of cream cheese, or put shavings of cheese over the holes and let it melt there, so the filling doesn't run out.) Reset the oven to 375°. Rinse the chard, remove the ribs (and discard), then coarsely chop the leaves (you don't have to dry them) and set aside. Dice about a quarter of the sausage; set aside. Melt the butter in a large skillet or saute pan and stir in the onion. Saute over medium heat for 5 minutes, then stir in only the diced sausage and garlic. Saute another 2 minutes, stirring, then add the chard. Cover and saute/steam for 5 to 8 minutes, stirring often, until the chard is soft and cooked down. Remove from the heat and leave uncovered. While that cools, slice the remaining turkey sauce into 1/4"-thick rounds. Set aside. Whisk the eggs in a medium-size bowl until evenly blended. Whisk in the half-and-half, mustard, salt, pepper, and hot sauce. Set aside. To assemble the quiche, sprinkle one of the cheeses over the bottom of the tart shell (but save the Parmesan for the top.) Using a large fork - which will give you good control - place half of the chard here and there in the shell. Add half of the sausage. If you're using 3 cheeses, sprinkle on another one now; otherwise wait. Slowly ladle about half of the custard over the filling. Repeat with the remaining chard, sausage, and custard. Sprinkle the Parmesan cheese on top. Bake the quiche on the center oven rack for about 40 minutes, until the top is light golden brown and the filling is somewhat puffy. Transfer to a rack and cool at least 30 minutes before serving. Makes 10 or more servings.